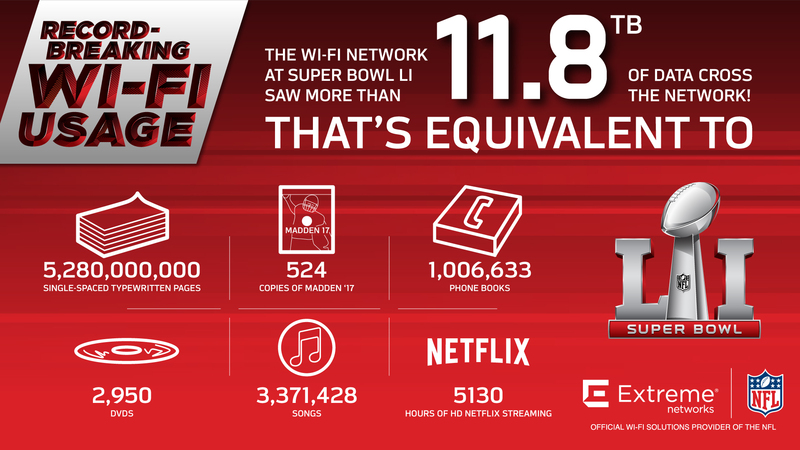 As you probably heard, Super Bowl LI broke the all-time record for most amount of data transferred across the network at a sporting event. This Extreme-powered wireless network easily handled 11.8 TB of data, which is a 17% increase over last year’s Wi-Fi usage. 11.8 TB is a lot of data, but what is that in real terms? We could say it’s 1.18e+13 bytes, but that doesn’t really help. So let’s look at some more realistic comparisons. It’s the equivalent to 5.2 billion single-spaced typed pieces of paper. Or 524 downloads of Madden ’17 for PlayStation 4. For those who still use phone books, this amount of data is equal to 1 million phone books. When we talk about data capacities in this range, it becomes hard to visualize just how grand of a scale we’re talking about. Making data comparisons to platforms you’re probably more familiar with, it would take 2,950 DVDs to hold 11.8 TB of data. It’s also more than 3 million songs or 5,000 hours of Netflix streaming. That’s a lot of episodes of Friends. Now, do you understand how much data 11.8TB is? It’s A LOT. And ExtremeWireless handled it with ease. Check out the infographic below to see the stats. To learn more details, join us on March 16th for a post-game wrap-up webinar with the VP of IT for the NFL.